The city of Tomis (Tomi for Romans), i.e. the nowadays Romanian municipium of Constanţa, was founded at the beginning of the sixth century before Christ by Ionian colonists come from Miletus. Ionia, the region of Miletus, lies on the shores of Asia Minor near the islands Samos and Chios. Towards the end of the third century B.C. Tomis had become an important sea fortress, that being also when first monetary issues were minted. Along many other Greek cities, Tomis was part of the great coalition rounded against the Romans by Mithradates VI Eupator (132 - 63 B.C., ruler from 120 B.C. to his death). The city fell to the influence of the great Dacian king Burebista betwix 50 B.C.. Licinius Crassus, in 29-28 B.C., seizes definitively the city inside the borders of the Roman Empire. Tomis was member of the Pontic city community, federation known as Hexapolis, as the very capital city. The other five member cities were Histria, Callatis, Dionysopolis, Odessos and Mesambria. The declared purpose of the community was celebrating the cult of the emperor, but likely there was more to it. The president of the federation was called pontarch. Tomis suffered great losses as result of the barbarian invasions. In 269 the city resisted heroicly against the migratory people coalition led by the Goths, the city losing the outskirts outside city walls that were burnt by invaders. Around 680 the city fell to the Slavs and Avars. The first Tomitan coins were struck in bronze. In the first century B.C. coin striking ceases. They struck again later until Philippus Arabs. 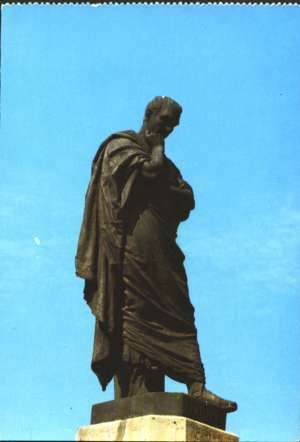 At Tomis the famous poet Ovid (43 B.C. - 17 A.D.) was exiled by the emperor Augustus. His poetic heritage about the ancestors of present day Romanians - the Dacians - is priceless. While exiled at Tomis (the present day Romanian region of Dobrogea) he wrote a huge lament known as the Pontics. Besides complaining about the harsh, unusual cold for one bred under the Italian sun, he also described accurately enough the local life. He said he was emprisoned inside city walls; outside them, he said the earth is grasped by white frost, the barbarian do not know Latin and the Greek is defeated by the Dacian language. An important mentioning indeed: regarding the ancient times the region involved (nowadays Dobrogea) is called Scythia Minor, although a fairer, more accurate and precise denomination is Pontic Dacia. It is not the point here to say no Scythians inhabited Scythia Minor, instead we should understand that Dacians also were populating the shores as part of the ancient Dacia and as main the ethnic element. Romanians built him a statue at Constanţa to preserve his memory on the very place he lived, suffered and created. A special Romanian wine that can be bought from the shops is called nothing less than "Tear of Ovid".